Maybe I’ve lived too long. 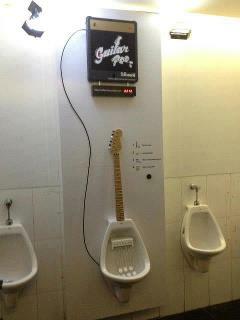 It seems a Brazilian company, Guitar Pee, has invented a musical urinal. When used, it rips off a screaming guitar solo. Now I’ve invested a lot of years and a lot of money into the slow perfection of the guitar craft. I’m a little ticked-off! It seems as though if I wanted to unleash my inner Clapton all I had to do was drink a liter of Diet Pepsi, stand back and let fly!